With the improvement in standards of living, the incidences of hypertension, hyperlipemia, and diabetes are also increasing. These diseases are risk factors for ischemic stroke[1-5]. The most fundamental cause of ischemic stroke is arteriosclerosis. Local and international studies[6-8] have shown that the main sources of cerebral microemboli are the extracranial and intracranial arteries. Among those arteries, an atherosclerotic carotid artery is the most common source of microemboli. 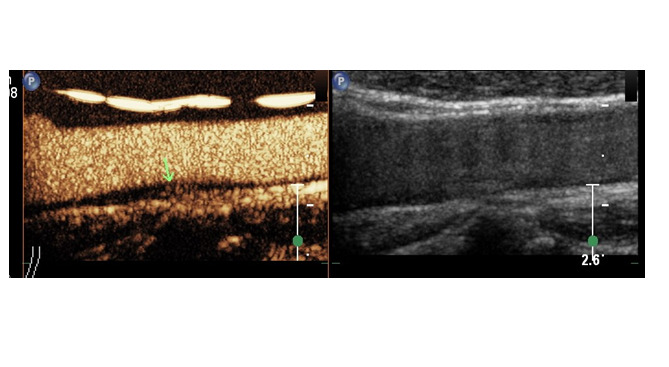 Contrast-enhanced ultrasound (CEUS) is a promising non-invasive method used to diagnose carotid atherosclerosis[9-11]. In our research center, more than a hundred patients with carotid atherosclerotic plaques were examined through CEUS. We analyzed the available data and we confirmed that a certain correlation exists between carotid plaques and arteriosclerotic ischemic stroke. However, as our research on carotid arterial plaques using CEUS progresses, we observed that in some cases, the quantitative analysis of CEUS cannot be executed because of significantly high carotid pulse. Some patients displayed abnormalities in their carotid artery, and a standard longitudinal section of their carotid artery cannot be examined. The position of carotid bifurcation in some patients is so high that carotid arterial plaques within the carotid sinus and initial segment cannot be observed. Some patients do not display a significant amount of carotid plaques, although they are clinically at risk for arteriosclerotic ischemic stroke; thus, these patients cannot be properly assessed. Therefore, finding another means to easily observe arterial plaque and that which demonstrates a good correlation with carotid arterial plaque and can serve as indicator of ischemic stroke is desirable. Atherosclerosis is a systemic inflammatory response[12,13], and the femoral artery is another window to evaluate the condition of atherosclerosis. This study investigated both the carotid and femoral arterial plaques in the same individual and determined whether the distribution of these plaques in microvessels is consistent or not. In addition, we speculate that the microvascular distribution of atherosclerotic plaque in the femoral artery is a potential risk factor for ischemic stroke. This prospective study enrolled 24 neurology patients hospitalized within July 2014 to January 2015. The ultrasound (US) of these patients revealed the presence of plaques both in their carotid and femoral arteries. The inclusion criteria were as follows: plaques were thicker than 2 mm and detected as hypoechoic, isoechoic, or mixed echoic. Among these patients, 18 were males and 6 were females. The average age of the patients was 66 ± 19 years old. The patients were divided into two groups: the carotid plaque (CAP) group and the femoral plaque (FAP) group. Each patient had undergone a standard vascular US examination wherein a 12 – 5 MHz linear-array transducer (Philips IU22) was used. Transverse and longitudinal images of each carotid and femoral arteries located on both sides were observed. Intima- media thickness (IMT), which is defined as lesions with a focal thickness of over 1.5 mm that protrude from the vessel wall into the lumen, was measured. In each patient, we selected the plaque with the maximum thickness (plaque-max). CEUS was performed using the same ultrasonic machine. We used the L12-5 probe under a pulse inversion harmonic contrast condition. The mechanical index was set to 0.07, the gain was set to 86%, and the focal point disposed below the rear wall of the artery was less than 1 cm. To clearly observe the presence of contrast agent in the plaques, we enlarged the CEUS images of the arterial plaques; these images show the arterial front and rear walls and the entire target plaques. We selected the maximum target plaque, which was detected as hypoechoic, isoechoic, or mixed echoic, and the probe was set in that region. Each patient received a cubital intravenous bolus injection of 2.4 mL of SonoVue (Sulphur Hexafluoride Microbubbles for Injection, Bracco, Italy), which was dissolved in 5 mL of 0.9% sodium chloride, and then the SonoVue was flushed with 5 mL of 0.9% sodium chloride. 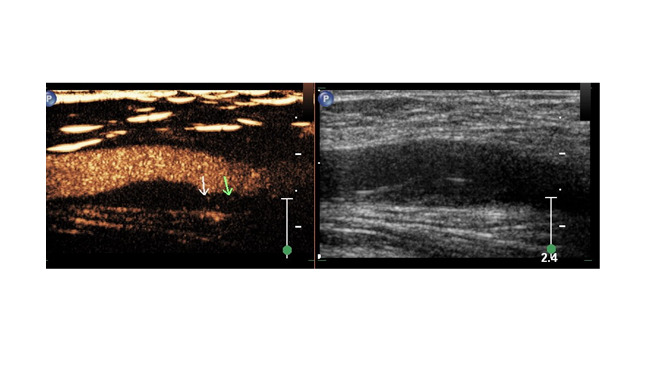 CEUS images were recorded under a dual-side mode, in which a contrast image was found on the left and a grey-scale image was observed on the right. We turned on the built-in timer of the instrument and then pressed the dynamic image capture button; in addition, the contrast agent was injected. Observations were conducted for 2 min. The time interval of obtaining the CEUS image of the carotid and femoral arterial plaques was at least 30 min. All CEUS observations were performed by two experienced physicians. The CEUS images were observed to analyze the distribution of atherosclerotic plaques in microvessels, as well the enhancement of their features. In addition, time-intense curves (TIC) were drawn using the quantitative analysis software, and the cine clips were stored digitally as DICOM to be reviewed offline. In CEUS image analysis, if the target plaque was characterized by a mixed echo plaque, the isoechoic or hypoechoic areas of the plaques rather than the strong echogenic area caused by calcification were analyzed. The degree of plaque enhancement was described as grades 0 to 4, as follows: Grade 0: no enhancement; Grade 1: the artery tunica adventitia is enhanced, whereas the plaque is not enhanced; Grade 2: few punctate enhancements are scattered in the plaque (Figure 1); Grade 3: linear enhancement extends into the interior plaque (Figure 2); and Grade 4: the plaque exhibits diffuse enhancement. Figure 1: Grade 2: few scattered punctate enhancements are observed in the plaque. Figure 2: Grade 3: linear enhancement extends into the interior plaque. The plaque ROI wrapped the entire plaque and the arterial lumen ROI placed on the same level. The size and morphology were both similar to those of the target plaque. The main parameters in the quantitative analysis of CEUS include plaque enhanced time to start (TTS), time to peak (TTP), plaque MEI, and the area under the TIC (AUC) (Figure 3 and Figure 4). Figure 3: QLAB analysis of carotid plaque. 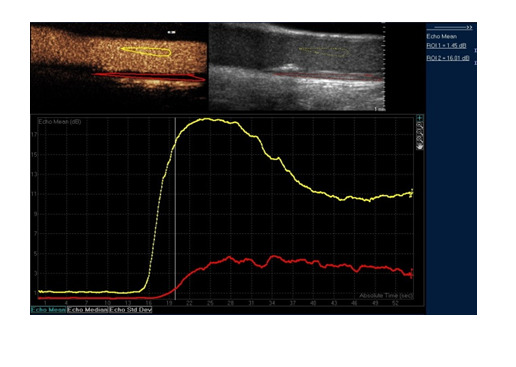 Figure 4: QLAB analysis of femoral arterial plaque. Statistical analysis was performed using the SPSS software version 19.0. Data were expressed as mean ± standard deviation. Quantitative data were compared by paired t-test. Wilcoxon rank sum test was used to compare qualitative data. P < 0.05 indicates statistical significance. Paired t-test revealed that the maximal plaque thickness of the two groups was statistically significant (P = 0.027). IMT was also statistically different between the CAP and FAP groups (P < 0.001). The TTS enhancement and TTP intensity of the plaque were both statistically significant (P < 0.001). By contrast, the MEI of the plaque and the AUC were both statistically not significant (P = 0.078 and P = 0.401, respectively) (Table 1). Table 1: Comparison of grey-scale and CEUS quantitative parameters between CAP and FAP groups. CAP: carotid plaque group; FAP: femoral plaque group. Data on the degree of plaque enhancement of the carotid arterial plaques were as follows: 1 case in Grade 4, 4 cases in Grade 3, 17 cases in Grade 2, 1 case in Grade 1, and 1 case in Grade 0. Data on femoral arterial plaques were as follows: 2 cases in Grade 4, 8 cases in Grade 3, 13 cases in Grade 2, and 1 case in Grade 1. The Wilcoxon rank sum test revealed no significant difference in the ultrasound contrast rating of the carotid and femoral arterial plaques (P = 0.251) (Table 2). Table 2: Comparison of the degree of plaque enhancement in CAP and FAP. In our study, the TTS enhancement and the TTP intensity of the plaques were statistically significant. In addition, the TTS of the femoral arterial plaque became significant later than that of the carotid plaque possibly because femoral artery was farther from cardiac than the carotid artery. Thus, the US contrast agents required more time to reach the femoral artery. The differences in MEI of the plaques as revealed by CEUS and quantitative analysis of CEUS of the AUC were both statistically not significant, suggesting the consistent stability of the carotid and femoral arterial plaques. Researchers[6-8] have reported that the main sources of cerebral microemboli are the extracranial and intracranial arteries and that an atherosclerotic carotid artery is the most common source. Therefore, in ultrasonic research, the carotid is the most common window through which the relevant factors for stroke are investigated[14,15]. The members of our study group performed numerous investigations on the microvascular distribution of carotid plaques; they also explored the microvascular distribution of carotid plaques in patients who are at risk of ischemic stroke. Our results showed that the stability of carotid and femoral arterial plaques in the same individual was consistent. The microvascular distribution of plaques and the degree of plaque enhancement were not significantly different between the two groups. Therefore, when a patient with both carotid plaque and femoral arterial plaque suffers from a strong carotid pulse, carotid abnormality, and high bifurcation position, we may observe the CEUS of the femoral arterial plaque to estimate the stability of the carotid plaque, which may predict the likelihood of ischemic stroke. Atherosclerotic plaques are commonly found in carotid and femoral arteries. Most studies investigate arterial sclerosis starting from the atherosclerotic carotid and femoral arteries. Studies on femoral arterial plaque are mainly conducted to predict the risk of cardiovascular and vascular diseases related to diabetes[16,17]. Some reports suggested that plaques in the carotid and femoral arteries both increase the risk of cardiovascular disease; thus, these plaques can be used to estimate the occurrence of cardiovascular events[18,19]. Other studies even suggested that assessment of the indicators of femoral arterial plaque over those of carotid arterial plaque can better predict the risk of cardiovascular disease. No studies predicting the onset of atherosclerotic ischemic stroke have been conducted. Atherosclerosis is a systemic disease that can affect many parts of the arterial system, the plaque which sonographic appearance is similar, and CEUS shows its micro-vascular similar distribution. Furthermore, the stability of the stocks of arterial plaques that demonstrate microvascular distribution in the femoral artery may also be one of the factors used to predict the onset of atherosclerotic ischemic stroke. However, the present study only selected the cases displaying both the carotid and femoral arterial plaques to prove the consistent stability of the plaques. In addition, when the carotid arterial plaque cannot be observed clearly, the stability of femoral arterial plaque may be used instead of the stability of carotid arterial plaque to predict ischemic stroke. However, a large sample size is required to assess whether femoral arterial plaque can be used as a predictive factor of ischemic stroke. The present study demonstrates that the microvascular distribution between the carotid plaques and the femoral arterial plaques were well consistency, the carotid plaques could be replaced by the femoral arterial plaques to predict the artery sclerosis type of ischemic stroke. We declare that we have no conflict of interest in connection with this paper. Ethical statements: All procedures were performed in accordance with the ethical standards of the responsible committee on human experimentation (institutional and national) and with the Helsinki Declaration of 1975, as revised in 2008. The study protocol was approved by our hospital ethics committee, and informed consent was obtained from all study participants prior to the ultrasound examination. 1. Liu, A.J., Guo J.M., Xia, W., et al. New strategies for the prevention of stroke. (2010) Clin Exp Pharmacol Physiol 37(2): 265-271. 2. Jia, Q., Liu, L., Wang, Y. Risk factors and prevention of stroke in the Chinese population. (2011) J Stroke Cerebrovasc Dis 20(5): 395-400. 3. Qureshi, A.I, Sapkota, B.L. Blood pressure reduction in secondary stroke prevention. (2011) Continuum (Minneap Minn) 17: 1233-1241. 4. Lager, K.E., Mistri, A.K., Khunti, K., et al. Interventions for improving modifiable risk factor control in the secondary prevention of stroke. (2014) Cochrane Database Syst Rev 5: 367-371. 5. Roger, V.L., Go, A.S., Lloyd-Jones, D.M., et al. Heart disease and stroke statistics–2011 update: a report from the American Heart Association. (2011) Circulation 123(4): 18-209. 6. Gordon, D.L., Crowley, H.M., Siouffi, S.Y., et al. Problems in the recognition of aorto embolic stroke. (1995) J Stroke Cerebrovasc Dis 5(2): 91-97. 7. Petty, G.W., Khandheria, B.K., Meissner, I., et al. Population-based study of the relationship between atherosclerotic aortic debris and cerebrovascular ischemic events. (2006) Mayo Clin Proc 81(5): 609-614. 8. Lin, R.J., Tang, S.C., Jeng, J.S., Stroke due to late in-stent thrombosis following carotid stenting. (2011) Acta Neurol Taiwan 20(2): 101-162. 9. Clevert, D.A., Helck, A., Paprottka, P.M., et al. Contrast-enhanced ultrasound imaging of the carotid artery. (2011) Radiologe 51(6): 483-489. 10. Shalhoub, J., Owen, D.R., Gauthier, T., et al. The use of contrast enhanced ultrasound in carotid arterial disease. (2010) Eur J Vasc Endovasc Surg 39(4): 381-387. 11. Ten Kate, G.L., van den Oord, S.C., Sijbrands, E.J., et al. Current status and future developments of contrast-enhanced ultrasound of carotid atherosclerosis. (2013) J Vasc Surg 57(2): 539-546. 12. Miele, L., Giorgio, V., Alberelli, M.A, et al. Impact of Gut Microbiota on Obesity, Diabetes, and Cardiovascular Disease Risk. (2015) Curr Cardiol Rep 17(12): 120. 13. Dearborn, J.L., Schneider, A.L., Sharrett, A.R., et al. Obesity, Insulin Resistance, and Incident Small Vessel Disease on Magnetic Resonance Imaging: Atherosclerosis Risk in Communities Study. (2015) Stroke 46(11): 3131-3136. 14. Varetto, G., Gibello, L., Castagno, C., et al. Use of Contrast-Enhanced Ultrasound in Carotid Atherosclerotic Disease: Limits and Perspectives. (2015) Biomed Res Int 293163. 15. Varetto, G., Gibello, L., Bergamasco, L., et al. Contrast enhanced ultrasound in atherosclerotic carotid artery disease. (2012) Int Angiol 31(6): 565-571. 16. Li, L., Yu, H., Zhu, J., et al. 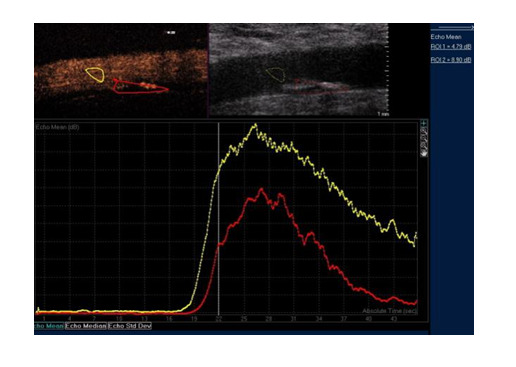 The combination of carotid and lower extremity ultrasonography increases the detection of atherosclerosis in type 2 diabetes patients. (2012) J Diab Complications 26(1): 23-28. 17. Schiano, V., Sirico, G., Giugliano, G., et al. Femoral plaque echogenicity and cardiovascular risk in claudicants. (2012) JACC Cardiovasc Imaging 5(4): 348-357. 18. Davidsson, L., Fagerberg, B., Bergström, G., et al. Ultrasound-assessed plaque occurrence in the carotid and femoral arteries are independent predictors of cardiovascular events in middle-aged men during 10 years of follow-up. (2010) Atherosclerosis 209(2): 469-473. 19. Barone-Rochette, G., Vanzetto, G., Detante, O., et al. Imaging of functional and structural alterations of large arteries after acute ischaemic atherothrombotic stroke or acute coronary syndromes. (2014) Archives of Cardiovascular Diseases 107(8-9): 443-451. 20. Yerly, P., Rodondi, N., Viswanathan, B., et al. Association between conventional risk factors and different ultrasound-based markers of atherosclerosis at carotid and femoral levels in a middle-aged population. (2013) Int J Cardiovasc Imaging 29(3): 589-599. 21. Anthea, M., Hopkins, R.L.J., McLaughlin, C.W., et al. Human Biology and Health. (1994) Englewood Cliffs, NJ: Prentice Hall.